There’s no denying that chocolate milk is a fan favorite, and for good reason – it’s delicious! But the benefits of chocolate milk extend far beyond taste. In fact, when it comes to chocolate milk nutrition, you’ll find the same nutrients found in unflavored milk, plus additional benefits that have made it the secret weapon of elite and every day athletes who are looking to perform at the top of their game. Is There Sugar in Chocolate Milk? In short, yes. But there’s more to the story behind the sugar in chocolate milk. Chocolate milk contains both naturally occurring sugar (lactose) and some added sugar. Government and major health organizations, including the American Academy of Pediatrics, agree people can enjoy some sugar (both natural and added) within the recommended daily amount, especially when it comes from nutrient-rich foods such as flavored milk. Unlike water and many commercial sports drinks, chocolate milk has naturally occurring protein to help repair and rebuild muscle. It also has fluids and electrolytes to rehydrate and replenish what’s lost in sweat. In fact, some research suggests milk may help you stay better hydrated after exercise than water.1,2,3,4,5 It’s the right choice for real recovery. So how does chocolate milk nutrition help athletes recover and return quickly to their full potential? Drinking lowfat chocolate milk, rather than a commercial sports drink, after a strenuous workout may help to boost athletes’ performance. Some studies suggest chocolate milk could help athletes boost power and even improve training times in their next bout of exercise later that same day, compared to when they drink a carbohydrate sports drink. 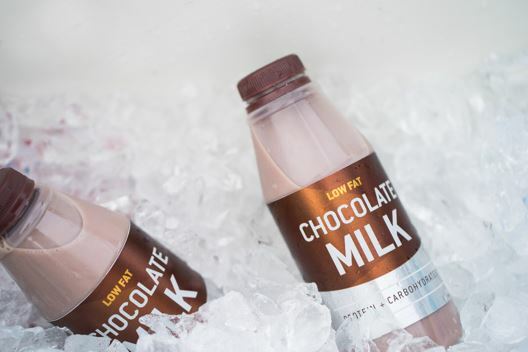 Lowfat chocolate milk naturally provides many of the same electrolytes (calcium, potassium, sodium and magnesium) added to commercial recovery drinks. The ratio of carbohydrates to protein in chocolate milk is the right mix for recovery, scientifically shown to refuel exhausted muscles. It also contains 8 grams of natural, high-quality protein, which delivers a protein advantage over some sports recovery drinks. When part of a regular workout and recovery routine, milk and milk’s high-quality protein also have demonstrated how athletes can gain more lean muscle and lose more fat as compared to drinking a carb-only beverage. Seery S, Jakeman P. A metered intake of milk following exercise and thermal dehydration restores whole-body net fluid balance better than a carbohydrate–electrolyte solution or water in healthy young men. British Journal of Nutrition. 2016;116:1013–1021.